The Video Poker game is based on the five card draw poker, with the important difference that the player has no opponent. Any hands that contain a winning card combination win the corresponding amount listed in the payout table. First the player places a bet, receives (usually) five cards, then decides which ones to hold and which to discard. Finally he obtains replacement cards in exchange for the cards he has discarded. All cards are randomly dealt from one card deck, except for the triple pay poker, where each of the three rows is dealt from a separate deck. The payout table is displayed in the upper part of the machine. It shows all winning combinations, in order of highest to lowest paying. For each winning combination the payout table lists how many coins are won if 1 to 5 coins are bet. The table is usually not proportional, five coins sometimes win more than five times the win of one coin. The column in the payout table that corresponds to the number of coins bet is always highlighted. When the player obtains a winning combination, the line in the payout table that corresponds to that combination is also highlighted. The center of the machine displays the cards. Most VP games use five cards, but there are games that may display more or less cards. The bottom part of the screen contains a number of buttons that control the machine. Each card has a corresponding HOLD button which marks the card as held. Other buttons are AUTO HOLD which toggles the auto hold feature of all Video Poker machines, BET ONE and BET MAX to select coins to bet and DEAL/DRAW to proceed to the next stage. To the left of the machine there is a panel with three buttons Cashier, Player Info and Exit Game, the display of the current account balance and the payoff for the last game round. 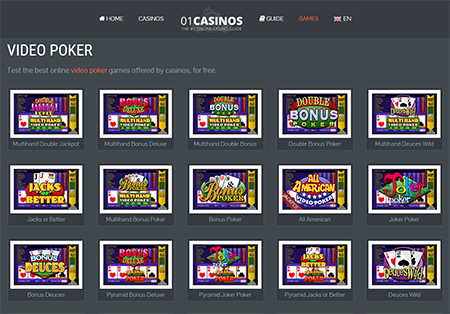 If you are a big fan of video poker and you would like to play without deposit at the beginning, you can visit our web page /www.pokerinusa.net. You will find all the variant you could get in a casino, and for video poker, you know there are a lot. Online-Poker-tv.com is part of a network of French websites. We support sensible Gambling. If you have a gambling problem please contact GamblersAnonymous.